The Biosecurity Major Incident Plan can be found here, outlining emergency response plans for both zoosanitary and phytosanitary risks. 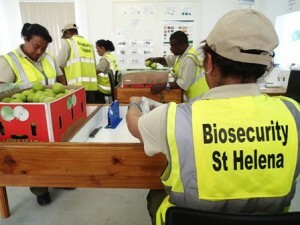 What can I bring into St Helena? Pests and weeds can sneak in by stowing away, hitchiking or being smuggled. Keep your eyes open! If you see something new or unusual – insect, weed, footprints – in your garden, at work or out hiking, report what youv’e seen or found to ANRD Scotland, on 24724, or hand it in to Environment, Tourism or the National Trust. The movement of shells, feathers, plants and plant products of some species is regulated under the Convention on International Trade in Endangered Species of wild Fauna and Flora (CITES), of which St Helena is a signatory. Application for import or export of species identified in Appendices I, II or III must be accompanied by a valid CITES export permit issued by the appropriate management authority in the country of export, unless covered by exemptions as specified in Article VII. Additional information can be obtained at: http://www.cites.org for details.